A wonderful group of woodland plants that need no introduction for most. We are looking for other species and forms especially double flowered forms. We currently are growing six different double flowered forms which when we have sufficient numbers we will offer. We are also looking for people to collect us Trillium seeds, any and all species. We recommend a well drained humus rich soil in dappled shade for best plant performance. N.A.Native. Ht. 30-45cm. Z4. This is a beautiful trillium with nodding pink to rose flowers with purple anthers. N.A.Native. Ht.130-60cm. Z4. A large sessile trillium with lite markings of the leaves. Flowers usually red but can be white, yellow or dark burgundy ( it will be a suprise). Forms a clump over a long eriod of time. Blooms April to June. Only a few available. N.A.Native. Ht.25cm. Z5. Leaves unmarked or faintly mottled, flowers dark maroon to brown. Blooms May-June. N.A.Native. Ht. 20-30cm. Z4. Purple-red flower set 2.5-5cm above leaves on a slender stalk. Petals are nearly erect, with purple red anthers bearing white pollen. Easily grown in humus-rich soil in shade to part sun. Blooms April to May. N.A.Native. Ht. 20-45cm. Z4. This is similar to T.erectum albiflorum in early bloom but after a few days turns a lovely light tan color. Flower is also slightly nodding. N.A.Native. Ht. 30-40cm. Z4. Similar to T.cernuum but nodding flowers almost always above the leaves. Flowers usually white but occasionally pink, red or brown. N.A.Native. Ht. 30-45cm. Z3. White flowers, turning to pink with age. Petal margins wavy, anthers yellow. N.A.Native. Ht. 30-45cm. Z3. 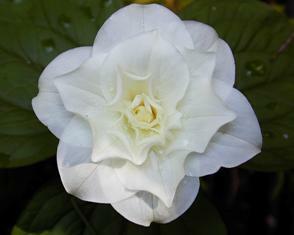 This is another white double T. grandiflorum with fully double white, camellia-like flowers. This, in our stock, is referred to as Trillium grandiflorum double form #5 as we have not been able to trace the origin of this double form. These are nice, bloom sized tubers. N.A.Native. Ht. 30-40cm. Z6. Fragrant, lemon scented yellow flowers and attractively mottled leaves. Blooms May to June. Easy to grow in humus-rich soil. Native. Ht. 25-60cm. Z5. Fragrant white flowers age to pink then to wine purple. Blooms March to May. Easy to grow. Native. Ht17-30cm. Z6. Young mottled leaves and white sessile flowers with a spicy fragrance. Leaves usually slightly mottled, fruit dark maroon. N.A.Native. Ht. 20-30cm. Z6. White flowers age to cherry red, petals inclined upwards. Bronze-green leaves. N.A.Native. Ht. 30-45cm. Z5. Brown-red flowers set atop mottled leaves. Easy grower, plant in shade to part shade. Native. Ht.5-15cm. Z3. A wonderful tiny trillium that forms clumps. Flowers range from white to pink often spotted with purple. These are four year old seedlings that are naturally very small (tuber much smaller than the size of a pea). These should bloom in a year. Ht.35-45cm. Z5. Reputed to be a hybrid between T.ovatum and T.rivale. It looks like a giant T.rivale and clumps up fast. Totally awesome. These are four year old seedlings that are naturally very small (tuber much smaller than the size of a pea). These should bloom in a year. Ht.5-10cm. Z5. We offer 3-4 year old seedlings of this beautiful pink form of Trillium rivale. Naturally tiny rhizomes. These are four year old seedlings that are naturally very small (tuber much smaller than the size of a pea). These should bloom in a year. N.A.Native. Ht.15-30cm. Z4. A sessile trillium with twisted petals laying somewhat horizontally with a prominant upright cluster of stamens. Flowers usually very dark red purple. Blooms April to June. Only a few available. Ht.30-70cm. Z4. A showy species similar to T.erectum with larger petals which are slightly recurved at the tips. Typically a rich maroon red but ranges from red to yellow and occasionally pink or white. Very large rhizomes. A must for any garden. It appears that the predominant form in our population is the rarer white form. We are unable to select individual colours. Ht. Z5. Large red nodding flowers. A beautiful species. We have just a few of these this year.